In the days leading up to Yom Kippur, I noticed some interesting Hebrew and Arabic videos circulating on social media talking about how the Jewish holiday of Yom Kippur and the Muslim holiday of Eid al-Adha coincide this year. (Here’s the one I liked best, posted by the Jerusalem Municipality, featuring Arab and Jewish Jerusalemites speaking about their experiences of Yom Kippur and Eid al-Adha and wishing each other the best for their respective holidays. Unfortunately there are no English subtitles.) I was wondering why I felt déjà vu, until I realized that it’s because, in a rare coincidence, the exact same thing happened last year. Now, while I have a reasonably thorough knowledge of Judaism and a working (if fairly superficial) knowledge of Christianity, my knowledge of Islam is woefully lacking. I have been attempting to remedy this by participating in online Jewish-Muslim dialogue, which has been enlightening and inspiring (and sometimes difficult, as all truly important dialogue is). Still, pretty much the only thing I could remember about Eid al-Adha was that there were slaughtered goats involved. Or was it sheep…? So I sent out a call for a guest letter on this holiday, and found Yasmina, a writer in Chicago who blogs for the Huffington Post and contributes to the Good Men Project (a project I happen to particularly appreciate, being the mother of three little boys, and the wife, relative, friend, and/or colleague of an impressive lineup of truly amazing men). You can find her personal blog at yasminareality.com. 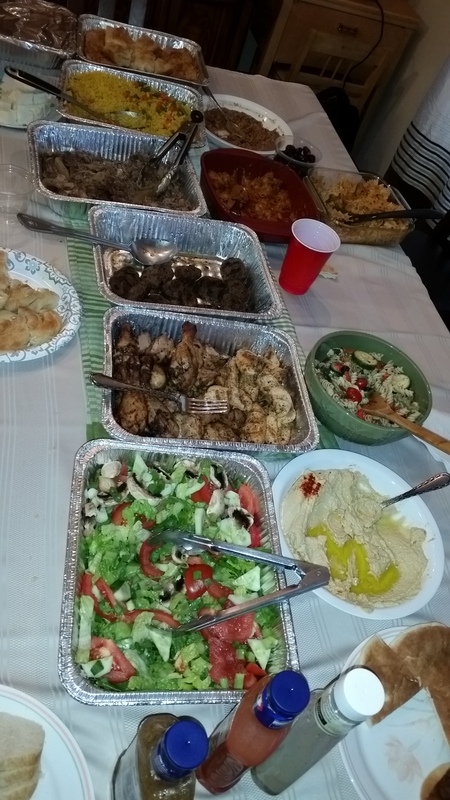 Yasmina was kind enough to tell us about this holiday and how it is celebrated in her family and community, and she even sent me pictures of their food! 😀 Enjoy, Eid Mubarak to all my Muslim readers, and happy day-after-Yom-Kippur to my Jewish readers! 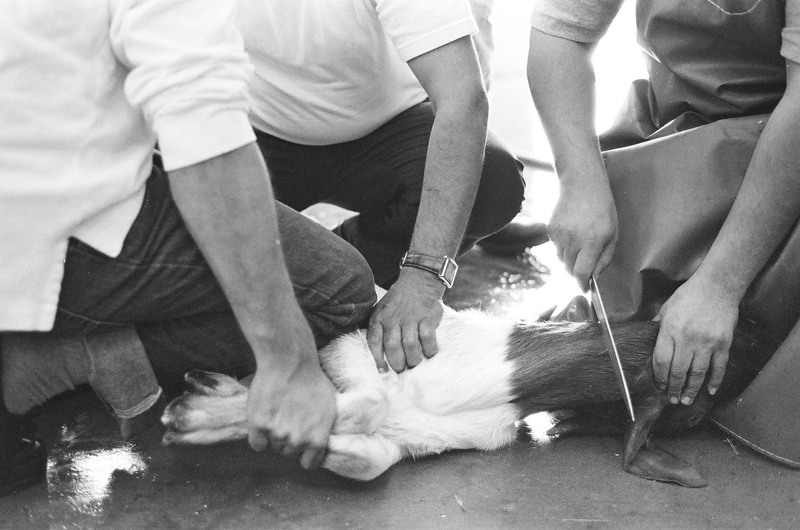 On Eid al-Adha, families pay for the halal slaughter of lamb and distribute the meat to the poor. It’s at this time too that the Muslim community welcomes back those who went to Hajj, the pilgrimage to Mecca that is required of Muslims who can afford it, once in their lifetime. Listening to the stories of the new Hajis during this time and how it has changed their lives is always awe inspiring. My family celebrates Eid the same way each year. We go to Eid prayer early in the morning and listen to the khutba (sermon) given by the Imam. It is usually an uplifting sermon encouraging worshippers to visit relatives and neighbors and to give charity. 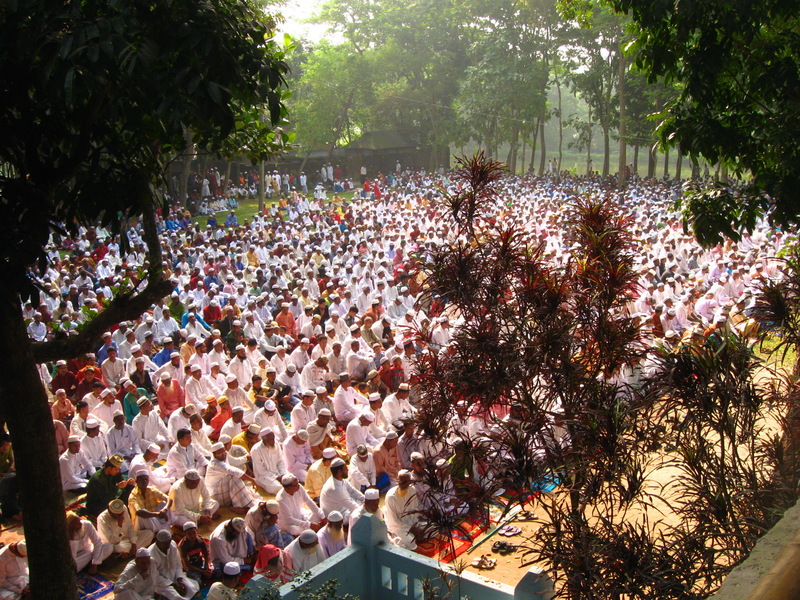 “Eid Prayers at Barashalghar, Debidwar, Comilla” by Mohammed Tawsif Salam – Own work. Licensed under CC BY-SA 3.0 via Commons. After prayer, people wish each other Eid Mubarak! Children run around the hall to the adults who give them dollars or candy. After prayer, we go to the cemetery which is flooded with other Muslims visiting their deceased loved ones on this holy day. We gather for Eid dinner as the final tradition for the day. My family is mixed heritage. We represent the cultures of America, Bulgaria, Croatia, Turkey, Palestine and India! Can you imagine the variety of food we eat on Eid with this type of representation? There is nothing like it! I will start making the Bulgarian banitza tomorrow which is filo dough filled with a mixture of butter, feta cheese and eggs. My sister in law will make butter chicken, a staple in her Indo-Pak upbringing. My cousin will make traditional Palestinian hummus, roasted lamb and kenafa. 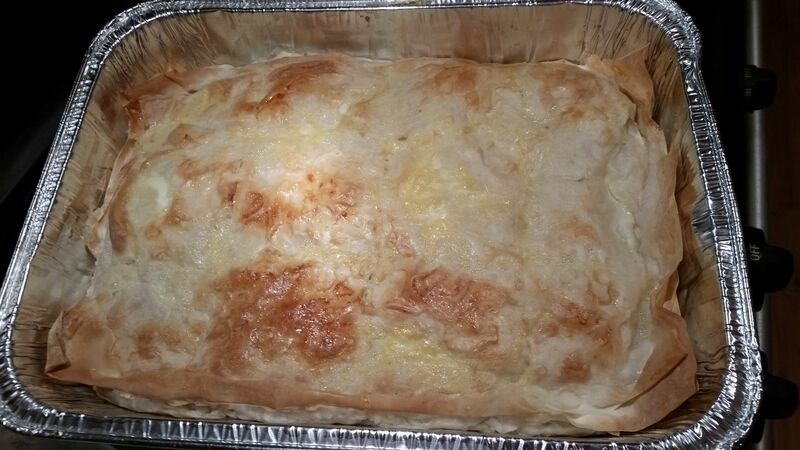 And we will have Turkish baklava for dessert as my auntie makes it the very best! We laugh, tell stories, pray, play with the children and enjoy family time which is how holidays should be spent. Hope you can join us some time, Josep! Want to tell us about your experience of Eid al-Adha, or a different holiday in your tradition? Send us a guest letter! Daniella, is there a translation of the term “Eid al-Adha”? We know Yom Kippur is Day of Atonement. But the Muslim holiday is unclear. Thanks!